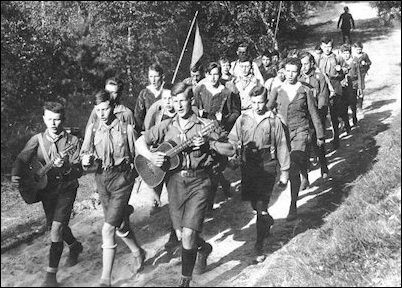 Before the Nazi Party was founded, a strong youth movement already existed in Germany. It began in the 1890s and was known as the Wandervögel, a male-only movement featuring a back-to-nature theme. Wandervögel members had an idealistic, romantic notion of the past, yearning for simpler days when people lived off the land. They rejected the modern, big city era and took a dim view of its predecessor, the industrial revolution, which had been started by their fathers and grandfathers. They scorned greed and materialism, and the new emerging corporate mentality. They found strict German schooling oppressive and rejected parental authority. They saw hypocrisy in politics and the rigid social class system of Kaiser Wilhelm's Germany, based entirely on birth and wealth. Instead, they longed for a Jugendkultur, a culture of youth led by youth, in which they would be truly valued as individuals. They wanted something greater to believe in than the staid values of their parents. Young German men march off to World War I in August 1914 with flowers in their rifle barrels and much jubilation. Below: A post World War I view of a scout-like formation of Wandervögels from Berlin on a hike. Below: A 1930 portrait of four young Wandervögels from Oberammergau looking somewhat like latter-day hippies. Wandervögel members distinguished themselves by wearing shorts and hiking boots rather than the starched shirts and creased trousers of the middle class. They delighted in rediscovering nature without any modern conveniences, traveling on long hikes and sleeping out under the stars. They sang old German folk songs around the campfire and also developed a custom of greeting each other by saying "Heil," meaning hail to you. This youth movement grew rapidly from 1900 to 1914, attracting the attention and grudging admiration of the mainstream political and religious establishment in Germany, which soon created its own competing youth groups, borrowing the back-to-nature theme and other ideas from the Wandervögel. The Catholic Youth Organization, the Boy Scouts, along with a variety of political, religious, paramilitary, and sports groups sprang up, organized so that youth was indeed led by youth, with the leader being just a few years older than the boys he led. 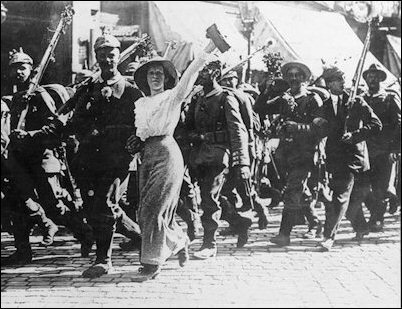 At the outbreak of World War I in 1914, most German youths were quickly caught up in the war mania that swept Germany and enthusiastically went off to the battlefield anticipating it as a noble experience that would mold them into 'new men.' In reality, they died by the millions, cut down by the machinery of modern warfare including machine-guns, mustard gas and explosive artillery shells. By 1918, Germany was defeated and soon plunged into political and social chaos. New political, paramilitary, religious, and sports oriented youth groups sprang up all over Germany, including the Young Socialists, Young Democrats, and Young Conservatives. Many of the groups adopted military style uniforms and established a hierarchy of formal ranks, a big change from the informal clothing and rule by consent of the pre-war youth groups. However, they shared some of the same themes, opposing a return to the old social status quo, while working to create an idealistic new era, a better Germany, a better world perhaps. Among the multitude of post-war political organizations hoping to lead Germany into the future was the German Workers' Party founded in 1919 in Bavaria, now led by young Adolf Hitler. In 1920, he renamed it as the National Socialist German Workers' Party (Nationalsozialistische Deutsche Arbeiterpartei) called the NSDAP or Nazi Party. That same year, Hitler authorized the formation of a Youth League of the National Socialist Workers' Party under the control of his storm trooper organization known as the SA (Sturmabteilung). A proclamation published in March 1922 in the official Nazi newspaper Völkischer Beobachter called for new members by declaring: "We demand that the National Socialist Youth, and all other young Germans, irrespective of class or occupation, between fourteen and eighteen years of age, whose hearts are affected by the suffering and hardships afflicting the Fatherland, and who later desire to join the ranks of the fighters against the Jewish enemy, the sole originator of our present shame and suffering, enter the Youth League of the NSDAP." Among the rules: no membership fees and an emphasis on "love of one's country and people; enjoyment of honest open combat and of healthy physical activity; the veneration of ethical and spiritual values; and the rejection of those values originating from Jewry." Weekly meetings were held featuring lectures and discussions. Every second Sunday was spent in mandatory hiking trips across the countryside. The League also established its own libraries for members excluding "trashy literature." The first uniforms were copied from the brownshirted SA. This caused resentment among the younger SA members who were sometimes confused with Youth League members. The new Nazi Youth League attracted very few members at first, competing against numerous other well established groups. In May 1922, the Nazis held a meeting at the Bürgerbräu Keller, a large beer hall in Munich, to officially proclaim the foundation of League. That meeting attracted only 17 youths. The Nazi Youth League was headed by Gustav Lenk who established small units in Nuremberg and other cities. 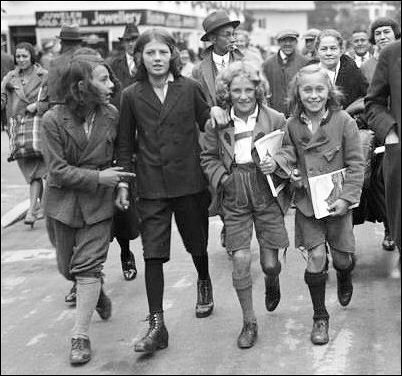 As the organization continued its slow but steady growth, Hitler officially named Lenk as National Youth Leader. In May 1923, Lenk published the first Nazi youth magazine, Nationale Jungsturm, which proved to be a money loser and was then reduced to a supplement of the Völkischer Beobachter. The Nazis were based in Munich in the German state of Bavaria which was a hotbed of political groups violently opposed to the German democratic government (the Weimar Republic) based in Berlin. By November 1923, the Nazis, with 55,000 followers, were the biggest and best organized. Nazi members now demanded revolutionary action. The result was Hitler's Beer Hall Putsch in which he attempted to seize power in Bavaria. On November 9th, a column of three thousand Nazis, led by Hitler, marched toward the center of Munich but soon encountered a police blockade. Shots rang out. Sixteen Nazis and three police were killed. Hitler fled the scene then hid out in the attic of a friend's home until he was arrested two days later. Other Nazi leaders were arrested or fled the country to avoid prosecution. Hitler went to prison. The Nazi Party and its Youth League were officially disbanded by the German democratic government. Most observers thought they had seen the last of Hitler.